This map includes pending and enacted legislation related to occupational licensing and other policies likely to impact career opportunities for foreign-trained immigrants and refugees. It is intended to support advocates, policymakers and practitioners working to reduce barriers to licensure and increase career opportunities for foreign-trained, work-authorized immigrants and refugees. You can filter the policies on the map by state, industry, and/or policy status by using the drop down menus on the right-hand side, or by clicking on the desired year. Results appear in the table below the map, where you can hover over the descriptions to read more about legislation and access corresponding links. You can also filter results by clicking directly on a state in the map. To deselect, click outside the map. If you’d like access to this data, please contact Sylvia Rusin at [email protected]. 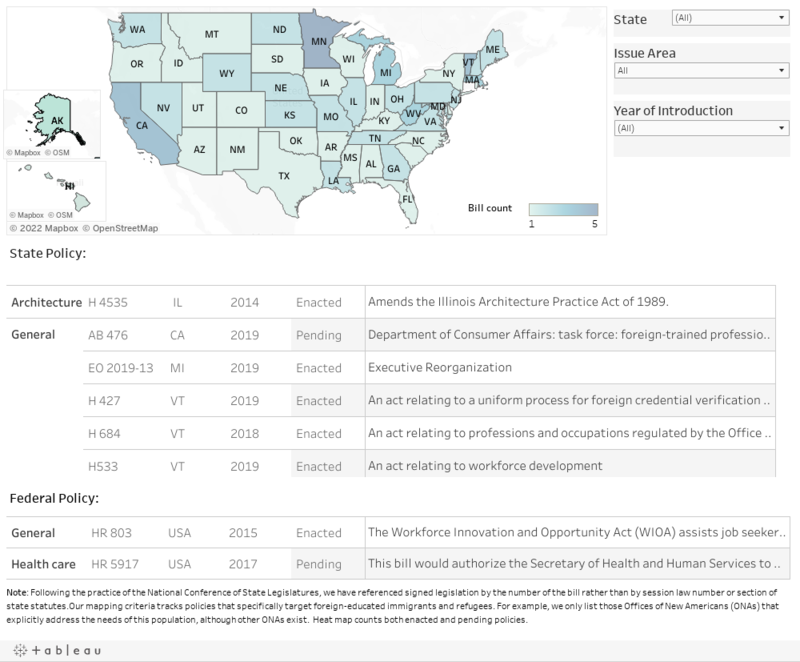 This map is the first of its kind to track state and federal legislation related to occupational licensing and other policies likely to impact career opportunities for foreign-trained immigrants and refugees. The map includes descriptions of pending and enacted legislation and other policies between 2014 and 2018 along with links to those policies. It was produced in support of policymakers, practitioners and advocates working to reduce barriers to licensure for work-authorized immigrants and refugees with training and credentials obtained outside the U.S. Special thanks to the National Conference of State Legislatures for their publicly available dataset of enacted legislation related to immigration which served as a major source of data for this map, and to Jacki Esposito and Jeff Gross for their expert guidance. Currently, the map tracks upwards of 20 state policies and we will be working to identify other relevant pending and enacted policies. Although we have focused mostly on legislation, each state also has state- and occupation-specific licensing requirements and steps to licensure (in the form of administrative policies and regulations) that are not always displayed on this map, although we do include some of these with the goal to identify more. For more details on state-specific requirements, consult with the state licensing board for the occupation of your choice. Want to add a policy or access data? If you would like access to our data, or if you have information about pending or enacted legislation or policies concerning occupational licensing for foreign-trained immigrants, please contact Sylvia Rusin at [email protected].